Netbooks are the bright spot in the world of personal computers. More powerful than a mobile phone, but without the bulk nor the power of a laptop, netbooks represent the "just right" mix of features, portability and price. The earliest netbooks came with various versions of Unix which made them downright scary to non-technical users. Then after some negotiations with Microsoft, a majority of netbooks now have Windows XP. 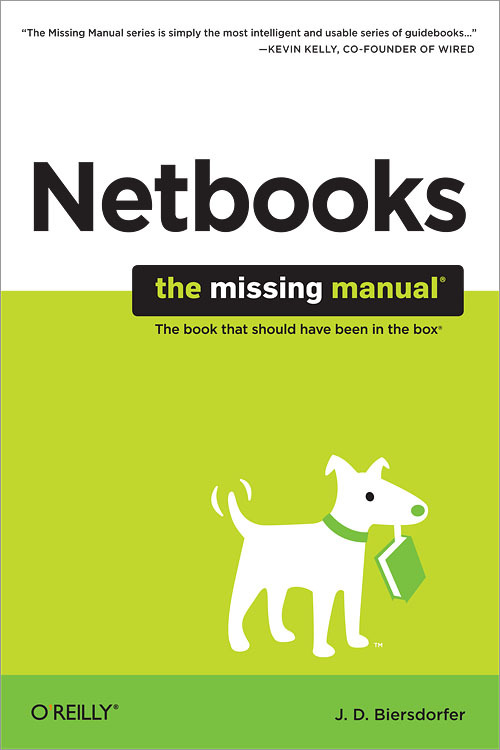 Netbook owners running Windows XP will find little value in this book. The book assumes no background with Windows and walks the reader through the very basics of setup and usage such as configuring email or an Internet connection. What is missing for Windows netbook owners is general tips and tricks specific to the unique characteristics of netbooks. Biersdorfer briefly covers some ideas for backup and synchronization, but doesn't go in enough depth to really be useful and worth the price of admission. In contrast, Biersdorfer's coverage of Ubuntu is invaluable for owners of netbooks that come with Ubuntu, such as the Dell Mini. I know when I first encountered a Mini with Ubuntu I was completely lost. While Ubuntu is intuitive, it takes some getting used to. Ubuntu doesn't come with a manual and Dell tech support as of this writing won't answer Ubnutu questions. Coverage of printer and email setup is something of value to Unix based netbook owners. All this stuff is out on the Internet, but this book is designed for the non-technical end user. The author's coverage is excellent and comprehensive. If you have a Windows-based netbook, take a pass on this book as a majority of the explanations apply to any Windows based computer. However, if you have a Ubuntu based netbook, you'll find this book an invaluable resource to translate your Windows knowledge into the Ubuntu world. Mobile Me: Is it worth it?